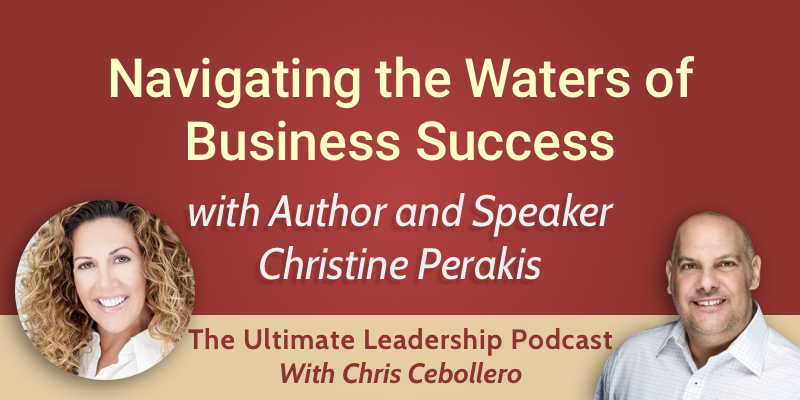 This week I am joined by bestselling author and speaker Christine Perakis. Christine talks about her experience with Hurricane Irma and how it shaped her leadership and business skills. In everything we do, there are leadership lessons to be learned. More often than not it’s the failures and the mistakes that really help polish us. On September 6th, 2017, Christine was alone in her home in the British Virgin Islands, which got hit by the biggest hurricane ever recorded in the Atlantic base. It was the second largest weather event in the history of recorded weather and it destroyed everything around and left them without infrastructure, running water, electricity, you name it. Christine had done all the preparations from her training before the hurricane, and she discovered she felt a sense of complacency. She had weathered other hurricane seasons before and her home, in particular, was very well protected. She thought that she was so well protected, that she spent the day before helping others. Her mentality in approaching preparation was the mentality of a boat captain going offshore who has to be fully functioning and self-sustaining. She soon learned the things she didn’t do well. She didn’t have a satellite tracker nearby that would have allowed her to communicate by text and email, and she didn’t have her VHS radio close, which used to be her main source of communication with the community when the telecoms were down. Despite her initial sense of security, she soon found out that complacency can kill. That’s also true in business and leadership. We should never allow ourselves to become complacent. When all hell broke loose, she was alone in her home. She didn’t know anyone else on the island who was alone during this hurricane. Two weeks later when they were hit again, she made sure that she was with her community. You learn from these experiences. In conflict and in disaster, it’s important to be with your team, and not just by yourself. Christine had to be mindful during the whole time while she was stuck in her house because she didn’t have anyone to talk to and there was no distraction. She spent a lot of hours writing down what she was learning every moment in order to make sure that she would never go through this experience the same way again. Christine discovered seven key leadership skills through her experience. The most important of them is tolerance for uncertainty and adversity. That’s being able to view challenges as opportunities. This is a critical cornerstone to coping with any situation: learning how to live in a rhythm that you can’t control, which is pretty much every day when you’re an entrepreneur. Christine chose to commit and devote everything she had to the community’s greater good. This sense of purpose helped her move in a direction. She had a vision for what needed to be done and then started doing it. She really learned how to best use her resources. It’s a skill set that most of us don’t ever have to think about, unless we’re starting a business or if our survival needs aren’t met. The passive role: that’s people who expect a designated leader to take over and give them what they need. They usually sit back and hope for the best, and are unwilling to assume a leadership role of their own. Peer leadership: being able to help your friends and your community in what they need. Self-leadership. What in me has to grow so that I can be a functioning member of this team, culture, society, or business? Exercising flexibility and being willing to step into each of this roles is critical to survival, to thriving, and to having a successful business.